ປະເທດຢີ່ປຸ່ນ(Japan、日本、にっぽん Nihon ນິຮົງ ຫຼື ນິບປົງ) ເປັນປະເທດທີ່ມີເກາະຍາວໃຫຍ່ເປັນແກນກາງແລະປະກອບໄປດ້ວຍເກາະນ້ອຍໃຫຍ່ທີຢູ່ອອ້ມຂ້າງ,ຕັ້ງຢູ່ໃນທະວີບອາຊີ. ↑ "法制執務コラム集「法律と国語・日本語」" (ໃນ ຍີ່ປຸ່ນ). Legislative Bureau of the House of Councillors. ສືບຄົ້ນເມືອ 19 ມັງກອນ 2009. ↑ "Population Count based on the 2010 Census Released". Statistics Bureau of Japan. ສືບຄົ້ນເມືອ October 26, 2011. 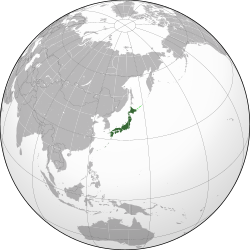 ↑ "Japanese population decreases for third year in a row". ສືບຄົ້ນເມືອ 9 August 2012. ↑ ໔.໐ ໔.໑ "World Economic Outlook Database, April 2018 – Report for Selected Countries and Subjects". International Monetary Fund (IMF). October 2018. ↑ "Human Development Report 2014". UN. 2014. ສືບຄົ້ນເມືອ 26 July 2014. ໜ້ານີ້ຖຶກແກ້ໄຂຄັ້ງລ້າສຸດເມື່ອວັນທີ່ ໑໘ ກຸມພາ ໒໐໑໙, ເວລາ ໑໓:໒໘.